Home Culture Ganapati Bappa Morya!! Ganapati Bappa Morya!! Ganapati Bappa Morya!! Ganapati Bappa Morya!! Ganesh elephant headed Hindu lord, son of Lord Shiva and Goddess Parvati is a first worshipped lord of Sanatan Hindu religion. Yes, he is believed as Vignaharta (Destroyer of obstacles) so he is worshipped first before the beginning of any work. Every Hindu knows the story of Shri Ganesh. Story mentioned in Shiv puran. Once, there existed a demon with all the characteristics of an elephant, called Gajasura, who was undergoing penitence (Tapas). Shiva, satisfied by this austerity, decided to grant him a reward, whatever gift he desired. The demon wished that he could emanate fire continually from his own body so that no one could ever dare to approach him. The Lord granted him his request. Gajasura continued his penitence and Shiva, who appeared in front of him and asked him once again what he desired. The demon responded: "I desire that you inhabit my stomach." Shiva being a Bhola (innocent) agreed. Parvati sought him everywhere, without results as a last recourse, she went to her brother Lord Vishnu, asking him to find her husband. He, who knows everything, reassured her that he will find out what has happened to Shiva. Then Vishnu, the omniscient director of the cosmic game, staged a small comedy. He transformed Nandi (the bull of Shiva) into a dancing bull and conducted him in front of Gajasura, assuming at the same time, the appearance of a flutist. The enchanting performance of the bull delighted the demon, and he asked the flutist to tell him what he desired. The musical Vishnu responded: "Can you give me that which I ask?" Gajasura replied: "Who do you take me for? I can immediately give you whatever you ask. The flutist then said: "If that's so, liberate Shiva from your stomach." Gajasura understood then that this must have been no other than Vishnu himself, the only one who could have known that secret and he threw himself at his feet. Having agreed to liberate Shiva, Gajasura asked Shiva for two last gifts "I have been blessed by you with many gifts, my last requests are that everyone should remember me adoring my head and you should wear my skin." From then Shiva wears Gajasura’s skin and that is why he also known as Gajacharmambara (Wearer of elephant skin). On hearing that Lord Shiva has been liberated from Gajasura's stomach and is on his way to Kailash, Goddess Parvati started preparing for a bath. As she didn’t want to be disturbed during her bath and Nandi was also not at Kailash to keep guard of the door, Goddess Parvati took the turmeric paste (for bathing) from her body and made a form of a boy and breathed life into him. This boy was instructed by Goddess Parvati to guard the door and to not let anyone in, till she finished her bath. Subsequently, when Shiva finally reached Kailash after spending a long time in Gajasura's stomach, he found himself being stopped by this strange boy. Shiva tried to reason with the boy saying that he was Parvati's husband but the boy did not listen and was determined to not let Shiva enter till his mother Goddess Parvati finished her bath. The boy's behaviour surprised Shiva. Sensing that this was no ordinary boy, the usually peaceful Shiva decided he would have to fight the boy and in his divine fury severed the boy's head with his Trishul thereby killing him instantly and destroying his head with the fire from his third eye. When Parvati heard of this, she was so enraged and insulted that she decided to destroy the entire Creation. At her call, she summoned all of her vicious multi-armed forms, the Yoginis arose from her body and threatened to destroy all. Lord Brahma, being the Creator, naturally had his issues with this, and pleaded that she reconsiders her drastic plan. She said she would, but only if two conditions were met: one, that the boy to be brought back to life, and two, that he be forever worshipped before all the other gods. Shiva, having cooled down as a sweet husband, agreed to Parvati’s conditions. He sent his Shiva-Bhoota Gana (Army of ghosts) out with orders to bring back the head of the first creature that is lying dead with its head facing north. The Shiva-dutas soon returned with the head of a strong and powerful elephant Gajasura, which Lord Shiva placed onto dead boy's body, breathing new life into him, Shiva kept on his boon to Gajasura, that his head has been always remembered by the people. And that day has been called as Ganesh Chaturthy, Bhadrapada masa Shukla paksha Chaturthy day, (Usually comes in end of August or beginning of September). Then he was declared as Gajanana and gave him the status of being foremost among the gods, and leader of all the ganas (classes of beings), Ganapati. And there on he has been blessed by all the Gods and Goddesses and with several names and powers. Goddess Parvati wished a son just like lord Vishnu, whom she believed as her brother and Ganesh also has same powers and qualities like Lord Vishnu. If you see his idols and photos, question comes in your mind that how come he has strange body structure? Rat symbolises Desire, it means he controls ones desires and rides on it. With all these odd combination of body and structure yet he looks beautiful. Ganesh is a Hindu lord whom one can draw in any manner with many things and he will not feel bad. Bhakti Ganapati- Devotional, usually worshipped by Farmers, in this avatar Ganesh has coconut and Bananas and its leaves in his hand. Veera Ganapati- Ganesh has 16 hands with many types of armours, worshipped by soldiers before wars for blessing of success. Shakti Ganapati- Power god, usually seen with one wife sitting on his lap, and flowers in his hands, worshipped for the prosperity and unity of a family. Dwija Ganapati- it means born twice, as story says he was born once by Parvati with her power and qualities and second time born by Shiva with his power of head replacement surgery in that time. In this form he has 4 heads. Siddhi Ganapati- Worshipped for prosperity, this form his idol is in yellow colour. Siddhi is also believed as his wife. Ucchishta Ganapati- This Ganesha has 6 hands with musical instruments. Vighneshwara- Golden colour Ganesha worshipped as destroyer of obstacles. Kshipra Ganesha- Red coloured Ganesh worshipped for best results. Heramba Ganapati- Ganesha had 5 heads and seated on Lion. Maha Ganapati- As the name says Maha mean great Ganapati worshipped for power. Natya Ganapati- Ganesh is in dancing pose. Oordrwa Ganapati- This ganesh is stature with all grains and sugar cane in his hand. Varada Ganapati- He is worshipped for Vara (boon). He has third eye which indicates knowledge. 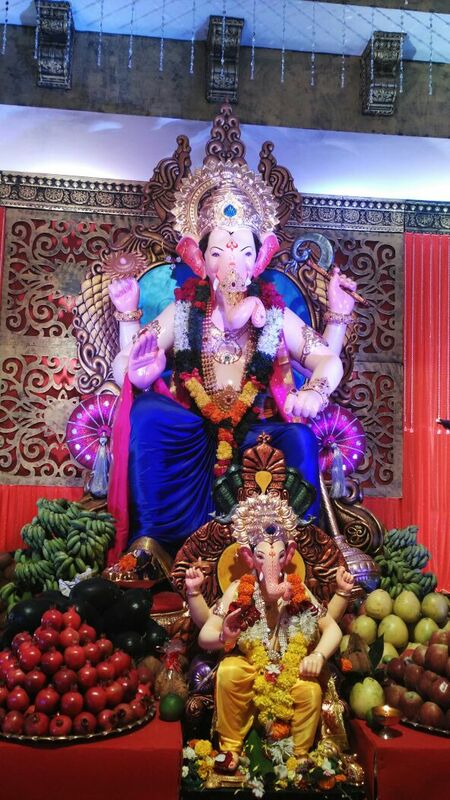 Triakshara Ganapati- He is seated with his favourite food Modak (sweet) in his hand. Kshipra Prasad Ganapati- He blesses very soon. Srushti Ganesh- Small form Ganesh who looks happy. Uddhanda Ganesh- He has 10 hands symbolising all 10 goodness in the world. Runamochana Ganesha- Usually in grey colour, he is worshipped to clear all the debts! Dhundhi Ganapati- Red coloured Ganesh holding Rudraksha in his hands. Trimukha Ganapati – Three headed Ganapati seated on lotus. Yoga Ganapati- Seated in Padmasana meditating Ganapati. Sankashta Hara Ganapati- Ganapati very famous for removing all the problems of human life. Apart from these he has been worshipped with several names and avaratas. Ganapati is a state god of Maharashtra. Popular Ashta Vinayak temples are located in Maharashtra. Apart from these famous temples, Mumbai’s Siddhivinayak Temple is highly devoted and one of top earning temple of India. Ganesh Chaturthy is celebrated grandly all over India especially western and southern parts of India. People decorate their house and put clay Ganesh for 1,3,5,7,9 and 11 days from thousands of years. And from 1893 Lokamanya Tilak introduced public Ganapati utsav by placing common Ganesh in different places to start unity in people during the British rule which was also helpful for them to encompass special meetings against Bristish rule. From then the Public Ganesh has become very popular in India which has become a culture now. 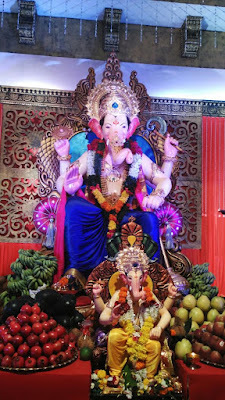 Most popular public Ganapati of India is Lalbaug cha Raja (Placed in Lalbaug Market Mumbai.) Crores of people visit him every year in those 11 days seeking for his blessings. He has been known as Navsacha (one who fulfils all wishes) Ganpati, a sure shot boon blesser. 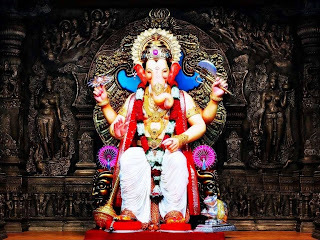 Lalbaug Raja was first worshipped by Koli women (Fisher women) who prayed for their permanent fish market and their wish was fulfilled they placed a Ganesh idol in 1934 and from then Lalbaugh cha Raja is known as Navsacha Ganpati. There are 300-400 employees work every year to organize the event. Family of Ganapati – We all know his family. He is a son of Shiva and Parvati, who are believed as creators of this world. His brother is Kumara Kartikeya or Skanda, also known as Shanmuga, a god of Martial arts and warrior God. In some parts of south Ganesha is believed as Bramhachari (unmarried) but in north he is believed as having 3 wives, Buddhi (Goddess of Intellect) Riddhi (Goddess of Prosperity) and Siddhi ( Goddess of Spiritual power). He also has two sons Shubha (God of Goodness) Laabha (God of Profit or benefit) and a daughter Santoshi (Goddess of Satisfaction). So overall, if you conclude he is an almighty who has everything under his control which anyone desires. So this Ganesh Chathurthy worship almighty Shri Ganesh and take his blessings for your happy and prosperous future.